The rift between car culture and filmmaking isn't what we might think. Considering both were invented and popularized at the same point in history, maybe this shouldn't be so surprising. Although the rabid devotion that both inspire in their most zealous followers can be intimidating and even non-relatable to the average person, automobiles and movies have nevertheless ingrained themselves into our lives at core levels. We want them to transport us. Despite the fact that a metaphorical ocean separates the intellectual/artistic interests of cinephiles and the automotive gear head's need for speed, film history bears out a long standing relationship. As long as there have been movies, fast cars have been a part of them. Strap a running movie camera to a car and go 200 miles per hour, and viewers will feel it on a visceral level. In just one such shot, cars and filmmaking converge in a manner that exploits both to their core. While the new documentary Havana Motor Club unites the two in the picturesque setting of Havana, Cuba, it is not built on such heady ground. And, it's all the better for it. Havana Motor Club is a refreshingly simple look at the impassioned local racing culture, and the unique challenges it's faced with. Yes, cameras are strapped to fast cars several times, but the point isn't so much the resulting visual kineticism in and of itself as it is Cuba from the racer's point of view. A blur perhaps, but a unique and discernible blur. For many of us in the West, Cuba is a country we don't see much of. Aside from its captivating look at Cuba's DIY racing culture, it's history as a forbidden sport, and the enthusiasts struggles to make it legitimate again, Havana Motor Club displays more of Cuba than many have seen before. Quaint and picturesque in its old world disheveledness, the vibe of a unique culture survives despite dictatorial oppressions. In simply hanging out with a colorful collection of racers, filmmaker Bent-Jorgen Perlmutt (Diana Vreeland: The Eye Has to Travel) has found a photographically satisfying way to show off their array of 1950s cars, and the country they prowl. At the time production of this film began, just a few years ago, the 1959 law that stated citizens could only buy and sell cars made prior to that year was still in full effect. The film provides a glance of the ruling as a blessing -- cool classic cars dominating the roads! -- and a curse -- as the years go by, it's less and less easy to maintain these aging relics. The racers we meet are busy tricking out these vehicles for maximum street racing potential. Sometimes the greatest pleasures of film viewing are the simple ones. In this case, "simple" doesn't forsake depth. 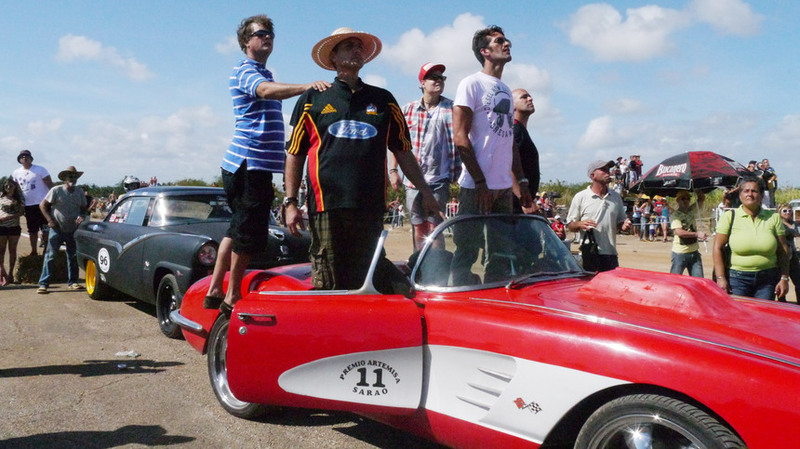 Hanging out and tooling around Cuba in classic cars, and experiencing the country's first legitimate race in decades, makes Havana Motor Club not just a breezy and satisfying documentary, but a terrific car movie as well. Havana Motor Club opens in select theaters and hits VOD April 8, 2016.